Though I am completely in love with the food and culture of New Orleans and many other cities of the South, I freely admit I am a culinary coward when it comes to spicy food, and generally will not indulge in some of the more popular dishes found in New Orleans and other parts of Louisiana. I always ask my server or host about the strength of the spice in a particular dish, and am usually told “Oh, it’s mild.” I clarify myself with “I’m a Yankee…from Connecticut…so, really, how spicy is it?” and then, with a slow grin, I am usually advised to order something else. 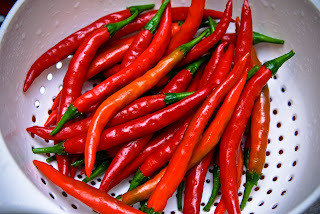 Fresh cayenne peppers (Capsicum frutescens) are the preferred hot capsicum (a type of pepper plant in the nightshade family) in the South and a key ingredient in hot and spicy dishes. The thin, long, hot pepper in its ground form is a common ingredient in Cajun dishes in particular. The ground powder adds reddish-brown color and fiery heat to sauces, soups, and stews. Cayenne peppers are remarkably diverse in cooking, eaten as readily as a spice or condiment with seafood (scallops, crab, oysters, sardines, smoked salmon and trout, fried mussels, lobster, and crawfish), egg dishes (omelettes and soufflés), meats (roasted, grilled, stewed, or fried), chicken, fish, or in vegetable dishes, soups, casseroles, hors d’oeuvres, and a variety of sauces (barbecue, shellfish, curries, cheese, Worcestershire and tartar sauces) and dips (salsa, avocado, and vegetable). Cayenne and other chili peppers were grown for thousands of years in the West Indies and Central and South America. Spanish explorers (who were clearly very busy and dedicated) introduced them to the rest of the world in the 15th and 16th centuries. Christopher Columbus is credited with introducing cayenne pepper to Europe (as a substitute for very expensive black pepper) after finding the capsicum on the Caribbean Islands, and Ferdinand Magellan is historically noted as introducing it to Asia and Africa. Today, cayenne peppers are grown on all continents. 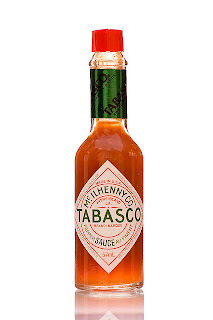 One of the most popular brands of cayenne is Tabasco sauce, which is the nationally marketed liquid form of cayenne pepper grown on Avery Island, LA. Recipes will note use of Tabasco or cayenne specifically because even though they serve the same purpose, each reacts differently in the cooking process and different quantities are required. The Tabasco company recipe search is worth a web visit for some great suggested uses of cayenne and Tabasco, such as this recipe for Cajun Blackening Rub. My full article about cayenne pepper in OKRA Magazine can be found here. Click here for a full archive of my nutrition articles.